Silicone Gel Insoles with FREE Heel Protectors! Designed to reduce pressure on the knees and back when walking or standing for an extended period of time. Absorbs the impact on the whole foot and can help reduce stress and strain on the ankle. Reduces muscular aches and pains. Provide excellent stability and cushioning effect. 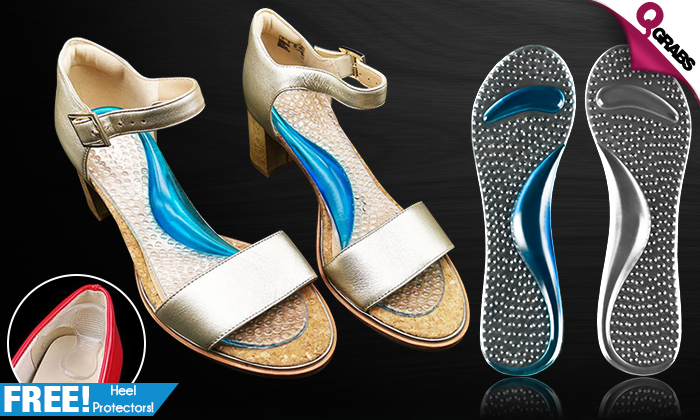 Ideal for ladies’ shoes, high heels, leather shoes, athletic shoes, new shoes, etc. Helps you adjust the space inside the shoes, make your shoes more comfortable and suitable for your feet. Prevents heels from scratching and blisters. Happy Feet with up to 60% off!